Sold by Underwater World INC. Diving in a drysuit means you're always warm and comfy, no matter how cold the water. The EVERDRY 4 offers the streamlined fit, comfort and flexibility of a wetsuit, with the thermal properties and water-tightness of a drysuit. 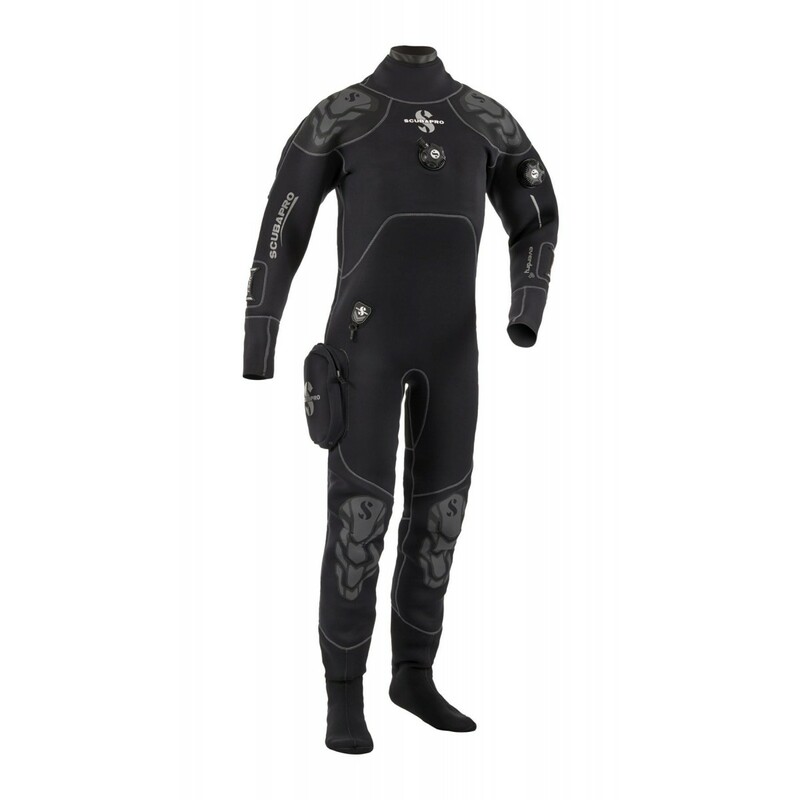 The EVERDRY 4 offers the ultimate in neoprene drysuit technology. 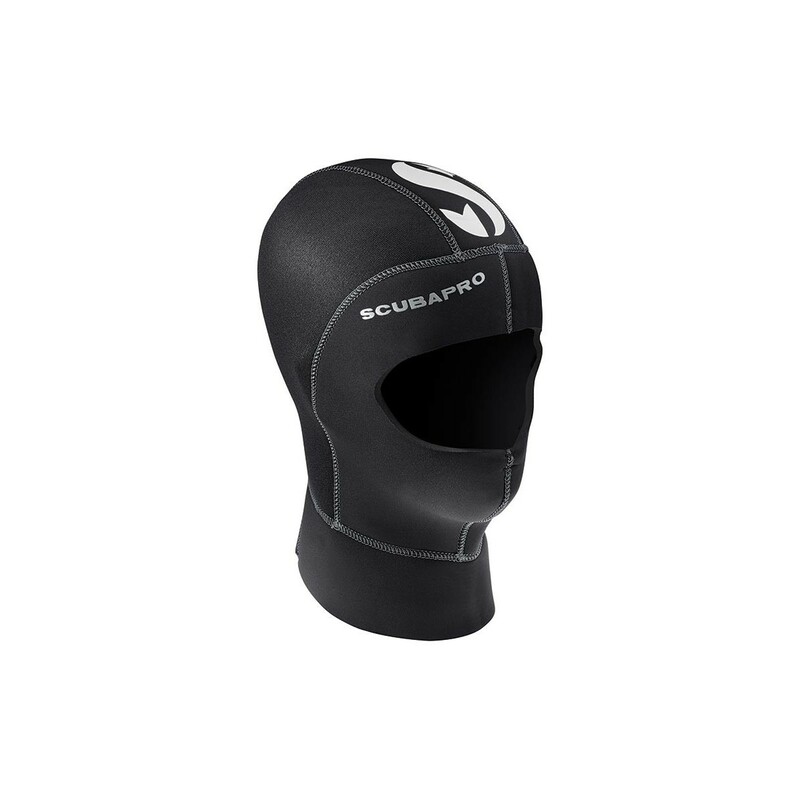 It is constructed of 4mm high-density neoprene sandwiched between layers of nylon jersey -- the heavier outside layer is designed to withstand abrasion, the lighter inside layer is more for comfort. Seams are triple-glued and double-thread blind-stitched on the outside; the inside is coated with a liquid polymer that penetrates the nylon layer and fuses to the neoprene, creating an extremely durable and waterproof seam. The EVERDRY 4's neoprene is able to resist compression at depth. This means you won't experience huge shifts in buoyancy as you descend, minimizing the amount of ballast you'll need to carry. It also means you won't lose as much of the suit's inherent thermal properties, so you don't need to wear as much in the way of undergarments. In fact, the EVERDRY 4 is designed to be worn with either a very thin undergarment or no undergarment at all. 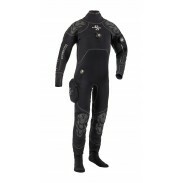 This enables you to enjoy a snug-fitting, streamlined suit as you're kicking through the water. The EVERDRY 4 features a first-rate neoprene neck seal that is smooth-skin on the outside and nylon jersey on the inside. Because of this, you can easily slip the suit over your head without any hair-pulling, then by folding the smooth-skin under you create a large-surface-area seal against your neck. Wrist seals use straight smooth-skin neoprene to achieve their watertight seals, and on the lower extremities attached neoprene soft socks can be used with drysuit boots or standard neoprene dive boots. The large kneepads are built tough to protect even the most avid bottom crawlers. The cargo hip pocket is sized right, easy to reach, and offers a zippered closure to keep contents secure. And the adjustable suspenders just make wearing a drysuit that much easier, both at depth and on the surface. Built for comfort, convenience and extended wear, theEVERDRY 4 fits like a glove, offers excellent range of motion, and most importantly, keeps your body heat in and the cold water out. • 4mm high-density neoprene weighs 50% less and is significantly softer than traditional drysuit neoprene. • Heavy-duty YKK drysuit zipper is covered by a neoprene overflap for added protection. • Attached neoprene soft socks enable the suit to be turned completely inside-out for cleaning and drying. • Handy right-thigh utility pocket with zippered closure provides a secure spot for carrying accessories. • Heavy-duty kneepads cover a lot of leg area for maximum anti-abrasion protection. • Men: S, M, LS, L, XLS, XL, 2XLS, 2XL, 3XL, 4XL.